Have you lost site of your child, just for a second ? I have, and just for that small period it seemed like hours ! No matter how close of an eye you keep on your child, they are fast and can wander off in a blink of an eye ! My little one is quick and thinks he can keep up and do what ever his older brothers (13 & 10 ) do. 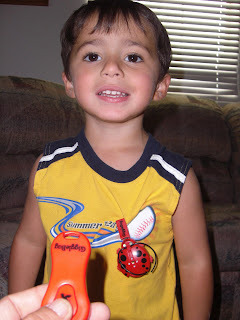 I came across a great product called the Giggle Bug and I thought it would be a great tool to use with my 2 1/2 yr old. I was excited that Giggle Bug sent us one to review ! What is a Giggle Bug ? The Giggle Bug Toddler Tracker provides parents, grandparents and other care-givers the ability to locate a missing child - indoors or outside - with the touch of a button. The Giggle Bug works on the same locating principle as a cordless phone handset finder. If a child wanders away, the adult/caregiver triggers the Toddler Tracker by pressing the button on the fob. The Giggle Bug unit will emit an 85 decibel BEEP and the bug's eyes will blink until the child is located and the adult de-activates the unit. 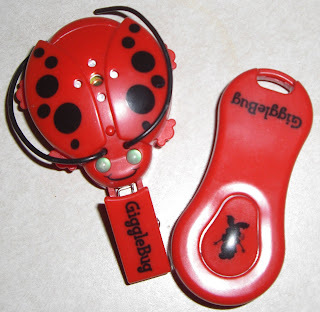 The Giggle Bug Toddler Tracker is designed to be used with children ages 18 months to 6 years and is ideal for malls, playgrounds, beaches, airports, etc. Replacement 3V coin cell batteries (No cr2032) may be purchased at most major retailers. Giggle Bug range is 75-100 feet indoors and 100+ feet outdoors. I really like that the Giggle Bug can be used indoors or outdoors. So far I have used it at the park, the store (when he will not ride in a buggy), and in the fast food indoor play place. I think one of the great features is that if your child takes it off their clothes or "someone" takes it off of your child the child unit will "beep" (LOUD) continuously and flash until the clip is opened and reattached. CLIP IT ON: Clip Bug to child's clothing before turning on. Remove battery tab. TURN IT ON: Hold down button on back of Bug (between wings) for 3 seconds. Once the unit is on, the eyes will continuously flash. BEEP IT: Find child by pushing down on hand-held unit. Bug will emit a loud but child-friendly beep. STOP THE BEEP: Push button on back of Bug (between wings). Bug unit resets for continued use. IF CONTINUALLY BEEPING : Attach to clothing to separate clip. TURN IT OFF : Hold down button on back of Bug (between wings) for 3 seconds. "Should the Giggle Bug become dislodged or is removed from the child's clothing and the clip closes, the unit will "beep" and flash until the clip is opened and reattached." See The Giggle Bug In Action ! The Giggle Bug can be purchased online HERE, it is available in red, green and yellow. Giggle Bug retails for 19.95 ! A Giggle Bug - Toddler Tracker ! Winner has been emailed, you have 48 hours to reply. Should the Giggle Bug become dislodged or is removed from the child's clothing and the clip closes, the unit will "beep" and flash until the clip is opened and reattached. The Giggle Bug operates on multiple frequencies, allowing the use of more than one at a time without interference. Has been featured on the View and Nanny911. Wow, my nephew needs this, he is always running around away from his parents. One interesting thing I learned was that you can use more than one at a time without interference. What a god send this would be for my sister who has three boys 4 and under. I like that fact that it works on multiple frequencies. I really like that it beeps if the child (or someone else) takes it off. My son is VERY active, so this would be great for us! The Giggle Bug comes in red, yellow and green. You get one free with each one you purchase...very nice! It has a tamper resistant safety alarm. I really like that it has a tamper resistant alarm so if someone (the child or someone else) tries to remove it, it will set off the alarm. OMY I love this, and NEED This, My third little man hasn't gotten "lost" yet, but my two older have done it to me a few times, plus It would be a good thing to use on my 3 year old who keeps running off in the stores because he's a big boy now and wants to walk. I'm also going to submit this to the local metromoms group that I attend events for. WAY TO GO! It works 75 feet to 100 feet indoors and 100 feet plus outdoors. The Giggle BUg has a range of over 100 feet outdoors! This would be great for my son who is always on the go! I became a facebook fan of Giggle Bug! The giggle bug has a large range. one fact is that The Giggle Bug will emit a loud, distinctive but child-friendly “beep” until the child is located and the adult resets the unit. I learned that if the Giggle Bug becomes dislodged or is removed from the child's clothing and the clip closes, the unit will "beep" and flash until the clip is opened and reattached. This is soo fantastic! And I learned that you can operate more than 1 'Gigglebug' on more than 1 child @ a time (As w/multiple siblings!) w/out causing interference!! !My Son/Dtr-in-law really need this for my Grandson, he's SO quick, and gets away just like that! Thanks for the Giveaway, it's great! I also follow your blog on my 'Google dashoboard', that saves time when I'm in a hurry & don't have time to open all my individual E-Mails!!! The Giggle bug has a range of over 100 feet outside. Very cool! Thanks for the chance. Comment on another post : There's a new edition of "Clue" for 'Harry Potter' fans! I think that's great, since the origianl has been around so long that if you've played it once, you've played it 100 times! Great game for "Family Game night"! I have twins so the fact that you can use multiple units would be great for me. It has a tamper resistent alarm so no one can take it off! It has a tamper resistant safety button. You can have more than one operating because they use different frequencies. What a great invention! One fact, outdoors has a range of 100 + feet. You are linked up on my blogroll. i love that you can use more thanone at a time, and that nanny 911 has mentioned them! Would love to win this for my grandson, I am a new Lala. The range of the Giggle Bug is 75-100 indoors and 100+ feet outdoors, and multiple units can be used simultaneously without interference. I follow on twitter and I tweeted the giveaway! website says The Giggle Bug range is 75-100 feet indoors and 100 + feet outdoors. It also has a 30 day money back guarantee. the giggle bug is awesome. FACT! It also has a tamper alarm which is even more awesome because hell-o 3 year olds always want to take things apart. The range is 75-100 feet indoors and 100 + feet outdoors (depending on obstructions, etc). The Giggle Bug comes in three primary colors - red, green & yellow. The Giggle Bug range is 75-100 feet indoors and 100 + feet outdoors. To find a missing child, the adult triggers the Giggle Bug by pressing the button on the hand-held unit. The Giggle Bug will emit a loud, distinctive but child-friendly “beep” until the child is located and the adult resets the unit. It comes in red, yellow and green! 1 fact that the giggle bug has: The Giggle Bug range is 75-100 feet indoors and 100 + feet outdoors. Range varies based on environment. Fact - you can use more than one unit simultaniously. I like this b/c I would like to put one on my 3 year old and another on my 6 year old since they seem to run in opposite directions when we are in a crowd. The Giggle Bug operates on multiple frequencies, allowing the use of more than one at a time without interference! Love your blog! Thank You!! The Giggle Bug's range is 75-100 feet indoors and 100 feet outdoors! I learned that should the Giggle Bug become dislodged or is removed from the child's clothing and the clip closes, the unit will "beep" and flash until the clip is opened and reattached. Exсellent blog you have got here.. It's difficult to find excellent writing like yours nowadays. I seriously appreciate people like you! Take care!! and covеrage! Keep up the wonderful ωогks guyѕ I've incorporated you guys to our blogroll. 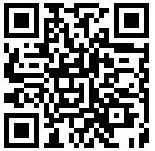 bit of it аnd i аlѕo havе yοu bookmarked to lоoκ аt new information in your blog.